When finishing the house, updating kitchen cabinets can be as easy as replacing doors and cupboards — or as big a task as completely switching out all the cupboards. Of course, the style and type of cabinets you decide on largely depends on your kitchen size and personal preference. There are three cabinet types: budget cabinets, mid-level cabinets, and premium cabinets. Budget Cabinets; often called stock, are inexpensive, off-the-shelf cabinets. Stock cabinets are usually limited in colors and styles. They are the money-saving choice if you aren't too picky about style options or don't demand a perfect fit. Another problem with these cabinets is that they are often made of thinly veneered particleboard, rather than higher-quality plywood. Style and trim options, sizes, and accessories are limited. Mid-Level Cabinets; are also called semi-custom cabinets. They are better and more expensive than budget cabinets. They offer more style options, including size, materials, finish, accessories and configurations which allows a more precise fit for your kitchen. However, the problem with this type of cabinet is that; as with budget cabinets, features and quality can vary considerably. Custom Cabinets; are the best and the most expensive option, but can include many added features you've chosen, and of course, your exact specs. They come with premium materials and hardware, but they could as well come in the material you request. Pick a style from our furniture store that will align with the shape of your kitchen. Consider the position and the number of widow, door, sink and any other features in the kitchen. Take measurement of the kitchen space or simply forward the floor plan of your kitchen to us for a proper estimate. hdflng.com offers the best kitchen cabinet buying guide in Nigeria. Hitech Furniture is a Furniture Manufacture in Lagos, Nigeria. 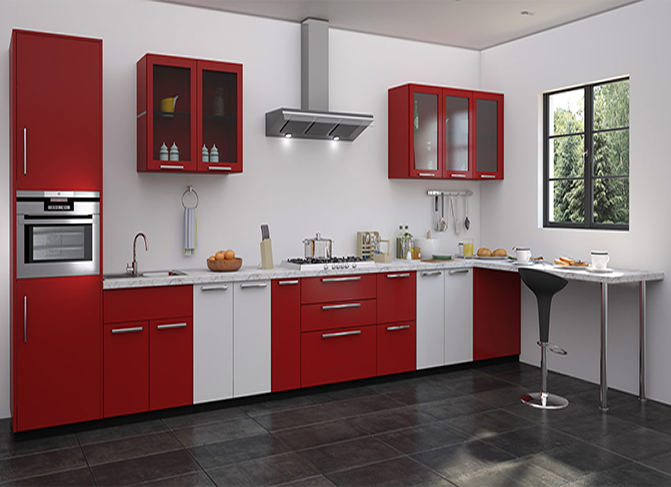 From our furniture store in Lagos, you can select your choice of kitchen.